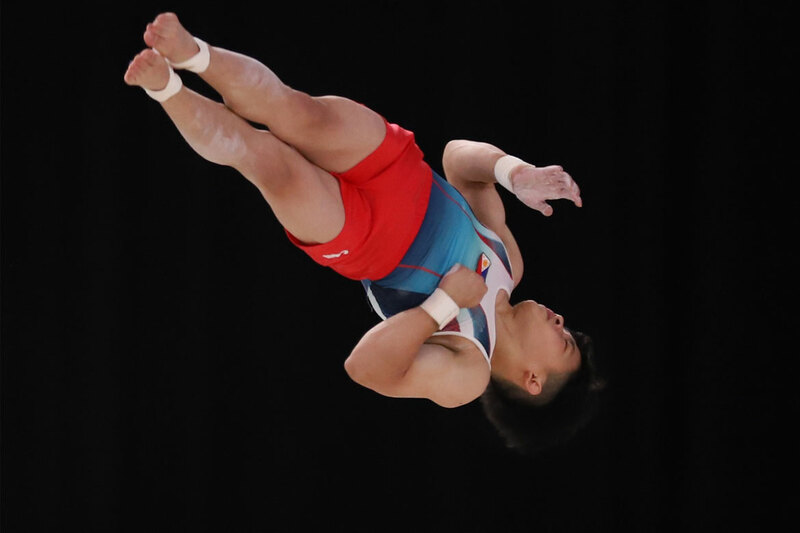 Carlos Yulo entered the men’s floor exercise final of gymnastics as the top-ranked athlete but wound up second to the last – no thanks to a daring routine he couldn’t complete – to bomb out of a podium finish in the 18th Asian Games on Thursday night at the Jakarta International Expo here on Thursday. 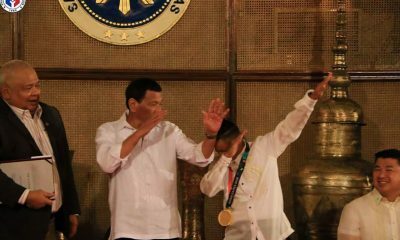 “Nagkamali po,” admitted Yulo, the 2018 World Cup silver medalist, who finished seventh among the eight finalists. Yulo carried a front-running 14.500 score from Wednesday’s preliminaries to the final, but failed to sustain fine form in his routine, committing a fatal error in execution to finish with 13.500. He had a difficulty rating of 6.100 and an execution score of 7.400. Carrior had high hopes for Yulo, and so did top officials of the Team Philippines. Yulo was a medal potential – a gold at that – following his gold medal finish in the Doha World Cup, where he beat Rio de Janeiro Olympics champion Ryohei Kato, pushing the Japanese to the bronze medal. 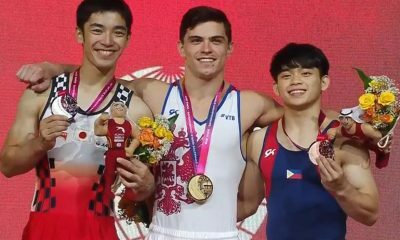 But Yulo wasn’t in his element when it mattered most, allowing Korea’s Kim Hansol to frolic toward the gold with a 14.675 score, Taiwan’s Tang Chiahung to the silver with 14.425, and China’s Lin Chaopan to the bronze with 14.225. For the first time in the Games, not even a bronze medal dropped into the Philippine coffers. The Philippines went without a medal for the first time since Sunday and fell to 18th spot in the medal tally board with one gold and five bronze medals. Elsewhere was bleak for the 272-athlete strong Philippine delegation. The Philippine bridge team – composed of Alberto Quiogue, Joseph Roman Maliwat Jr. III, Kong Te Yang, Romulo Virola, Eleazar Cabanilla and Andrew Falcon – finished 10th overall during the Men’s Team Qualification Round 7 with its overall score of 61.74. With a better place in seventh but still out of the running was the other Philippine Bridge Team of Gemma Milagros Mariano, Mary Cristy Ann de Guzman, Victoria Egan, Francis Allen Tan, George Soo, and Francisco Alquiros in the Super Mixed Team Qualification Round 5 with its 43.85. Also coming up empty-handed was taekwondo jin Arven Alcantara, who absorbed a 5-26 beating at the hands of world number 1 and back-to-back (2010 at 2014) Asian Games gold medalist Daehoon Lee in the Men’s -68 kg quarterfinals. Lee was also the silver medalist in the 58kg division of the 2012 London Olympics and the 68kg category of the 2016 Rio de Janeiro Olympics sa Brazil. Prior to this, Baby Jessica Canabal also fell to Nahid Kiyanichandeh of Iran, 15-23 in the women’s -49 kg quarterfinals. In Palembang, a medal remained elusive for Filipino bowlers for the second straight day on Thursday. The ace team of Kenneth Chua, Merwin Tan, and Enzo Hernandez wound up in 10th place in men’s trios at the Jakabaring Bowling Center. 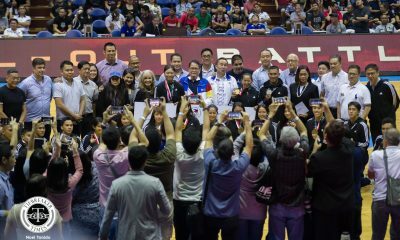 Similar to their women’s counterparts the previous day, the Filipino troika couldn’t cluster their big games together, combining for a six-games series tally of 4134, 210 pins off the victorious Japanese triumvirate of Tomuyuki Sasaki, Shogo Wada and Shusako Asato, with 4344. Malaysia (4235) bagged the silver, narrowly relegating Singapore (4226) to the bronze medal at the sold-out bowling arena built specifically for this sportsfest. The other Philippine squad of Jomar Jumapao, Kenzo Umali, and Raoul Miranda combined for a meager 3777, languishing in 27th place out of 33 teams.